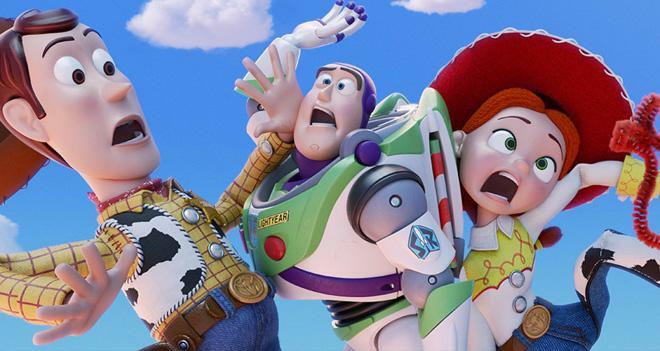 Disney/Pixar has released a new trailer for Toy Story 4. The animated sequel will hit theaters on June 21, 2019. Woody has always been confident about his place in the world and that his priority is taking care of his kid, whether that’s Andy or Bonnie. But when Bonnie adds a reluctant new toy called "Forky" to her room, a road trip adventure alongside old and new friends will show Woody how big the world can be for a toy. Toy Story 4 stars Tom Hanks as Woody, Tim Allen as Buzz Lightyear, Annie Potts as Bo Peep, Joan Cusack as Jessie, Wallace Shawn as Rex, John Ratzenberger as Hamm, Blake Clark as Slinky Dog, Jodi Benson as Barbie, Kristen Schaal as Trixie, Bonnie Hunt as Dolly, Jeff Garlin as Buttercup, Laurie Metcalf as Mrs. Davis, and Tony Hale as Forky. The film is directed by Josh Cooley (Riley’s First Date?) and features a story by John Lasseter, Pete Docter, Andrew Stanton, and Lee Unkrich. Jonas Rivera (Inside Out, Up) and Mark Nielsen (associate producer of Inside Out) serve as producers. In addition, Randy Newman will return to compose the score. The original Toy Story was first released back in 1995. The movie was followed by Toy Story 2 in 1999, and Toy Story 3 in 2010. Meanwhile, beyond the Toy Story franchise, Disney recently released Ralph Breaks The Internet on 4K Ultra HD Blu-ray and Blu-ray. The movie serves as a sequel to 2012's Wreck-It Ralph.